Two Coptic Christian children, aged 10 and 9, arrested after being accused of tearing up pages of the Koran. Two Coptic Christian children, aged 10 and 9, have been arrested for insulting religion in the Upper Egyptian governorate of Beni Suef, Ahram Online reported on Wednesday. According to the report, the two children were arrested on Tuesday after the imam of their local mosque filed a complaint against them. By order of the prosecution the two boys, Nabil Nagy Rizk and Mina Nady Farag, are now being held in the Beni Suef juvenile detention pending further investigation on Sunday, said the report. Ibrahim Mohamed Ali, the village imam, has accused the children of tearing up pages of the Koran. An Ahram Online reporter in the area said Ali initially took the children to the church and requested that the priest punish them. 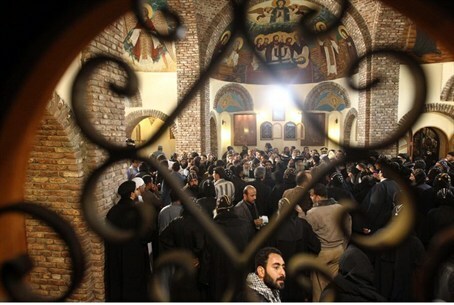 Most of those arrested were Copts accused of "insulting Islam,” Ahram Online noted. In a recent similar case, a young Pakistani Christian girl with Down’s Syndrome was arrested for allegedly burning pages of the Koran. The girl, Rimsha Masih, could face life in prison or even the death penalty under Pakistan’s strict and highly controversial blasphemy laws. Police in Pakistan have arrested an imam on suspicion of deliberately framing her. Copts in Egypt have been nervous since Islamists came to power following an uprising that toppled president Hosni Mubarak last year.